Relax and enjoy all the Adirondacks have to offer with perfect lake front accommodations. This charming, cozy cottage is surrounded by spectacular views, features many amenities and brand new baths. Large, well equipped kitchen with open access to the living room. Enclosed front porch offers exceptional views of the lake, especially at sun rise and sun set. Newly renovated bunk house with 1/2 bath offers private accommodations for couples vacationing together or those with older children (bunk house rental is optional). Close to golf, boating, fishing, hiking, sight seeing & more. I visited the Adirondacks and fell in love. Willsboro Point offers great access to Lake Champlain, only 4 miles from the Essex Ferry for quick access to VT. Willsboro is small and quiet, but offers great dining and entertainment. Swimming in the lake, walking around the point, hiking local mountains and trails, boating, biking, eating & drinking. 50 feet of beach front with dock and mooring. Beautiful view of Rattlesnake Mountain across the bay. My family could not have been happier with this adorable cottage! The location is beautiful! My family had one of our best vacations at this wonderful cottage! The kitchen was fully stocked, beds and sofas were comfortable, and we had all the modern conveniences we needed. Our favorite part was the view! It was so peaceful to sit and look out at the water and the mountains. Our kids had so much fun playing in the water too! The cottage is located close to several big attractions (Ausable Chasm, Natural Stone Bridge, Fort Ticonderoga) and it was a short ferry ride to Vermont. The owners were wonderful and answered all my questions ahead of time. We hope to be back soon! Wonderful cozy cottage & bugallow. Everything you need for comfortable stay. Our second time stay. Planning on another! This camp was perfect for my family of three. My nine year old daughter loved the bunk house (which quickly became her "she-shack"). The cabin had everything we needed and it was very clean. Especially nice was the view and the beach and the close proximity to Indian Bay Marina. This is a good value, and I would stay there again. Thank you for your review. We are so happy you enjoyed your stay at our cottage. And we love the "She Shack" and think it is the perfect name. We hope to see you again next year! cute cottage on a great bay! There is a load of great outdoor stuff to do around Willsboro Bay. We hiked Rattlesnake, rode bikes to ferries and VT, sailed to secluded beaches and waterfalls. The cottage is open, airy, and comfortable for 2 couples, or family with young kids. This is a real cottage with woodwork all over, old stove that worked so well, beds are very confortable. Lots of windows, so you feel like you are outdoors from anywhere in the cottage. Bathroom is very clean, lots of towels supplied by owner. Great for boating, we left our boat at the mooring just in front of cottage. For gas you have to go to Willsboro Bay Marina which is 7-8 mtes boat ride. The marina near the cottage does not have gas. Waterfront is not steep,goes down slowly, wear water shoes for rocks, water is clean, no algues, ducks passing by every evening. Great neighbors ready to help and owner very accomodating and can be reached anytime. Nice old fashion village grocery store with a butcher that remembers your name the second time. Ma dad was in a wheelchair and could go all around the lot since it is leveled. This was one of the most pleasant vacation cottages I have ever rented. The size is perfect for 2 to 6 people and it is extremely clean and comfortable in every way. The kitchen has everything you need for preparing great meals, the living room is very homey and there is a great view of the lake from almost every room of the cottage. I appreciated having cable TV, internet and good cell phone reception. The bathroom is modern with a wonderful shower and the beds are extremely comfortable. 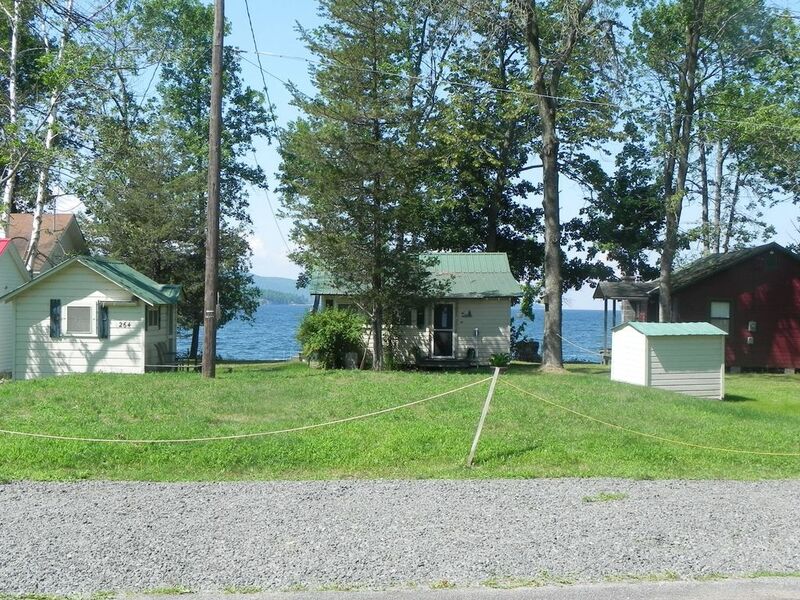 The house is located right on the shore of Willsboro Bay and has an amazing view north into Lake Champlain and a view west so you can see the Metroliner snake through the mountains on its way to Montreal. The dock is great for boating but it's also wonderful for pulling out at chair and reading a good book or just watching the light change over the water. Swimming is excellent here because the bottom is sandy and the water very clear. Also, it's protected because speed boats do not come into the area except to dock. The town of Willsboro is fairly quiet, but very pretty and has a variety of very accessible activities - a lovely 9 hole golf course, well-maintained public tennis courts and nearby hiking. There are two market/gas stations close by with all the necessities and excellent meat counters, so you don't have to go far for groceries. The two close-by marinas have restaurants, so dining out is convenient. Bicycling is perfect along Corlear Drive because it's fairly flat with very little car traffic. The owner was very personable, responsive and very pleasant to work with. What more can I say? I can't wait for next summer!